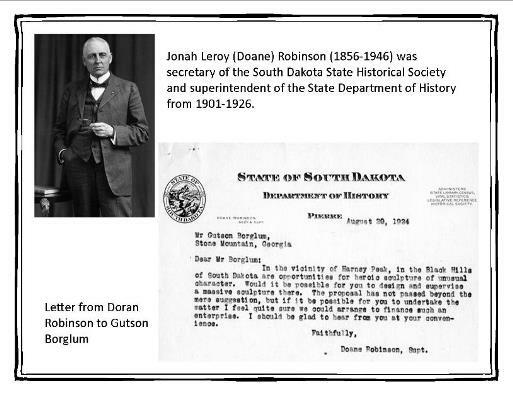 Historical correspondence of Doane Robinson, first secretary of the South Dakota State Historical Society, is now available on the South Dakota Digital Archives. Jonah Leroy (Doane) Robinson (1856-1946) was secretary of the South Dakota State Historical Society and superintendent of the State Department of History from 1901-1926. The Doane Robinson Collection consists of correspondence, manuscripts, poetry, genealogical data, census and related statistics, and miscellaneous papers. Some of the subjects form the Robinson collection added to the South Dakota Digital Archives include correspondence relating to Mount Rushmore, Peter Norbeck, La Verendrye, Arthur Mellette, Sacagawea, South Dakota State Capitol artwork, Martin Charger, Royal C. Johnson, William Henry Harrison Beadle, Valentine T. McGillycuddy and state census materials. Volunteers scanned 3,304 documents comprising 44 folders of correspondence creating 4.12 gigabytes of digital information. This amounts to only 5 percent of the total folders in the Robinson collection. The South Dakota Digital Archives, an online resource, was launched in January 2012 by the South Dakota State Historical Society to provide researchers digital access to unique historical records. There are currently more than 46,000 images (including photographs, manuscripts, government collection finding aids and land survey field notes) available for viewing. The State Archives is a program of the South Dakota Historical Society. State Archives staff are available to help assist with research and can be reached at (605) 773-3804 or archref@state.sd.us. For more information, visit www.history.sd.gov/Archives. Photo of-- Doane Robinson, secretary of the South Dakota State Historical Society and superintendent of the State Department of History from 1901 to 1926.